This plant is also commonly referred to as the Chicken Wire Plant, because the woody spines which persist for over a year after the plant has died back look just like chicken wire. At its best it forms very attractive cushions, which are coloured a beautiful green (from the leaves) and gold (from bracts that are shorter than the leaves). 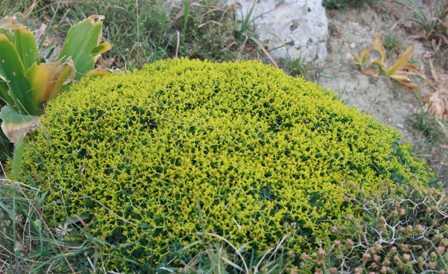 This plant is at home in rocky places that many other plants would find inhospitable; it thrives on low-level ledges, hillsides and cliffs but can also be found on lowland plains and in the garrigue or phrygana. The 'chicken wire' effect produced by last year's spines. The main growth time is in the spring, and Greek Spiny Spurge brightens up the landscape with its bright cushions from March onwards. 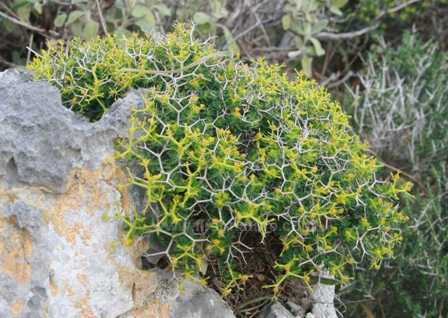 This plant belongs to the family Euphorbiaceae, and it is found in Crete, Greece and Turkey. The plants shown on this page were photographed in Crete in early April.